Last but not the least, we have this 5 lbs. 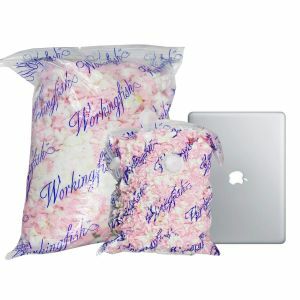 shredded memory foam bean bag filling from Workingfish. This is an odor free, non-toxic memory foam pack that can make your old sagging bean bag plump again. It is soft, comfortable and has zero sharp edges. Other than bean bags, this can also be used for couches, love seats and soft toys. Most varieties of foam are crammed to the brim with toxic chemicals. This one from Workingfish though, is child safe and can even be touched by pregnant women. Also, it is made from 100% fresh polyurethane sponge and not some old recycled sponge that often stinks. It comes in a vacuum sealed bag that expands to 2.54 cubic feet of foam. If you have foam left after use, you can reseal the bag and tuck it away for storage. The package also includes the hand pump to vacuum seal it again. While it is a known fact that memory foam bean bag refill typically lasts longer than conventional pellets and beans, Workingfish takes it a notch ahead and offers a 38-month warranty on the foam. That’s phenomenal value at this price point. The grumble that we have with this memory foam bean bag chair filler is identical to what we had with the earlier one. 2.5 cubic feet of foam is just not enough to fill an adult bean bag, especially if you prefer a firm texture. Otherwise, this is a near-flawless bean bag filler. With a 38-month warranty to back it up with, it’s hard to go wrong with the Workingfish Shredded Memory Foam.